Unreleased track from Robby Krieger and John Densmore's band after The Doors, the Butts Band. "Lovin' You For All The Right Reasons", written by Robby Krieger, was originally recorded for release on their second album "Hear and Now". In 1973 Ray Manzarek, Robby Krieger and John Densmore went to Europe to audition singers for The Doors. After a few auditions they all decided it wasn’t working and agreed it was time for the Doors to disband and go their separate ways. While Ray went back to Los Angeles to start his solo career, Robby and John stayed in London and put together their own band. They chose Jess Roden as their lead singer, who incidentally was one of the singers they had just auditioned for The Doors. The band would be called the “Butts Band” and would include Krieger, Densmore and Roden along with keyboardist Ray Davies and bassist Phil Chen. 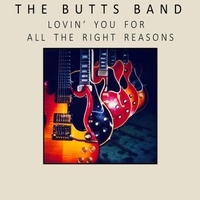 Following the release of the debut Butts Band album, the band had issues with touring and working on new material due to the fact that Robby and John were located in Los Angeles and all the other band members lived in London. To resolve this, Robby and John hired a new group of musicians from the LA-area. Brought in were Michael Stull (guitar/piano), Alex Richman (keyboards), Karl Rucker (bass), Bobbi Hall (Congas) and an additional drummer, Mike Berkowitz. The resulting album was “Hear & Now” which went away from the bluesy feel of the debut album and has a much more soulful sound. Five of the album’s ten tunes were Krieger originals, two were covers (“Get Up, Stand Up” and “If You Gotta Make A Fool of Somebody”), and the remaining three tunes were written by other band members. "Lovin' You For All The Right Reasons" was originally meant to appear on that release.